My Mom gave me some of her Easter decorations after lunch yesterday. I am painting some smaller pieces for my upcoming shows. Hydrangeas might be my favorite flower. I love all the variety in their color. This is painted on an 8 x 8 x 2" canvas. 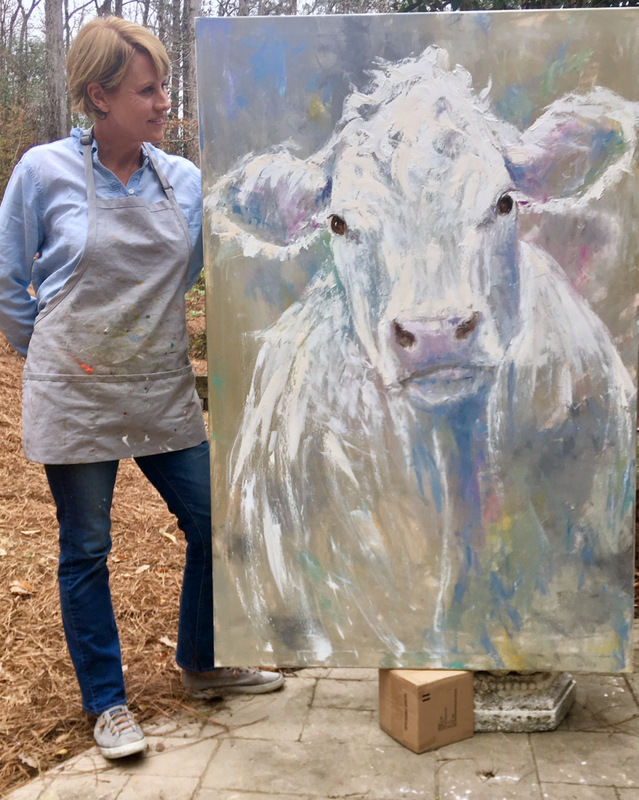 I would love to see you in Oxford, MS this Saturday, April 27 for the Double Decker Art Festival. 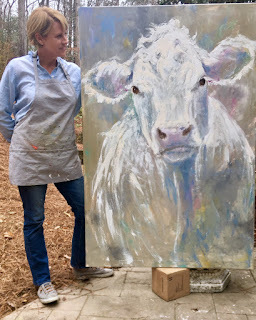 I will be in Mountain Brook, AL the following Saturday, May 4, for Art in the Village. 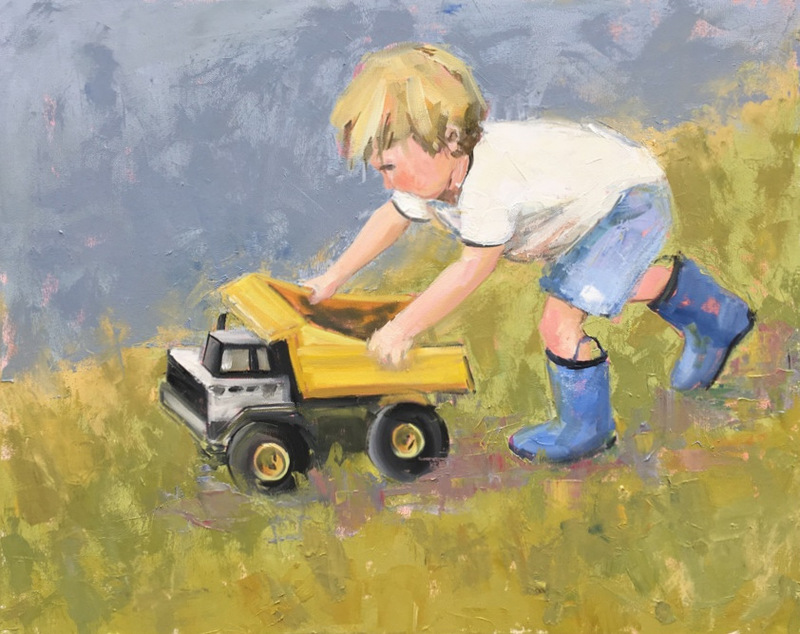 It is the Mountain Brook Art Association's annual Spring show. It is the first art show I ever participated in and is still one of my favorites. I have not posted a lot lately because of being so busy at shows. My last two shows were great but very challenging weather wise. My tent and work flew back 50 feet in Jackson, MS a few weeks ago due to straight line winds. My husband and I were there and were grateful not to be harmed or harm anyone else. I had to replace all my tent poles and one vinyl side. I use a wonderful Trimline tent from Flourish. I had it weighted down with sixty pounds on each corner. It was very scary and a first for me. I was fortunate to just lose two pieces. So.... I only got in one day at that show. The next weekend I had a show in Atlanta. The Dogwood Show was great but 75% of the artists (including me) took their work down after two days because of bad weather forecast for the third day. No regrets. This art biz is not always the easiest. I will be in Oxford , MS next Saturday, April 27 for the Double Decker Art Festival. The following Saturday, May 4 I will be in Birmingham for Art in the Village. It is an annual show for the Mt Brook Art Association. Two shows that I love dearly so I am hoping for clear to partly cloudy skies. 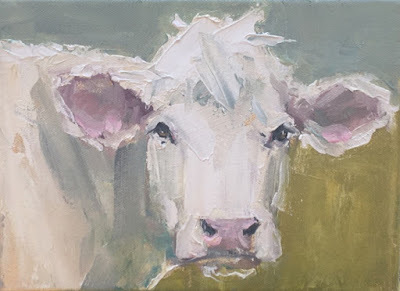 This Easter cow is painted on an 8 x 8" canvas. Happy Easter! More cotton. I swiped this cotton from the fields next to my sister's home in north Alabama. It is so pretty when it is in bloom. This piece is painted on a 12 x 24 x 2" canvas. 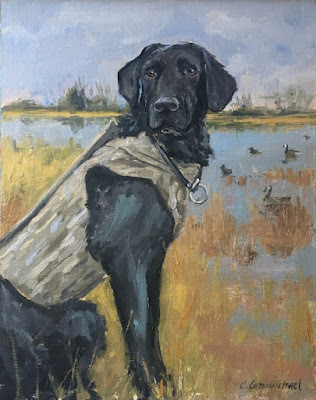 Come see me in Ridgeland, Mississippi at the Ridgeland Fine arts Festival this Saturday and Sunday, April 6 and 7, if you are in the area. The following weekend, April 12-14, I will be in Atlanta at the Dogwood Arts Festival. Come see! This painting survived many threats today. I was so close to scrubbing it out until my husband Dan came in and saved it. He said, "I love it." He does not say that about everything I paint. He is a really good critic and I mean that in a positive way. I am a lone painter so he is my second set of eyes. This is painted on a 15 x 30 x 2" canvas. I am gearing up for my Spring shows. Come see me next weekend in Gulf Breeze, Fl if you are in the area. This is painted on a 6 x 12 x 2" canvas. This is a commissioned piece for a friend. It is painted on a 24 x 24 x 2". It always feels good to complete a piece that you were not so confident about during the process. I am not good at photographing large pieces so I let my husband help. I thought I would get in the picture so that you could see how large it is. This is painted on a 40 x 60 x 2" canvas. This piece was two different paintings before the cow appeared. A different cow and then an abstract. I did so much scrubbing and wiping that my hands were sore. It all turned out fine in the end. Hope to see you at one of my Spring shows! This is a commissioned piece for a friend. She is surprising her husband with the painting for his birthday. This pooch could throw this ball and then also fetch it. Hours and hours of fun. This is painted on a 10 x 10 x 2" . 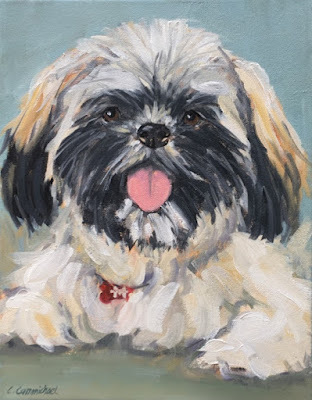 Shih tzus hold a special place in my heart because I had one that looked much like this for thirteen years. I have painted this image of this rooster many times on different shapes and sizes of canvas. I never get tired of his curious look. This was one of my sister and brother in law's bantam roosters. Very small but very proud. 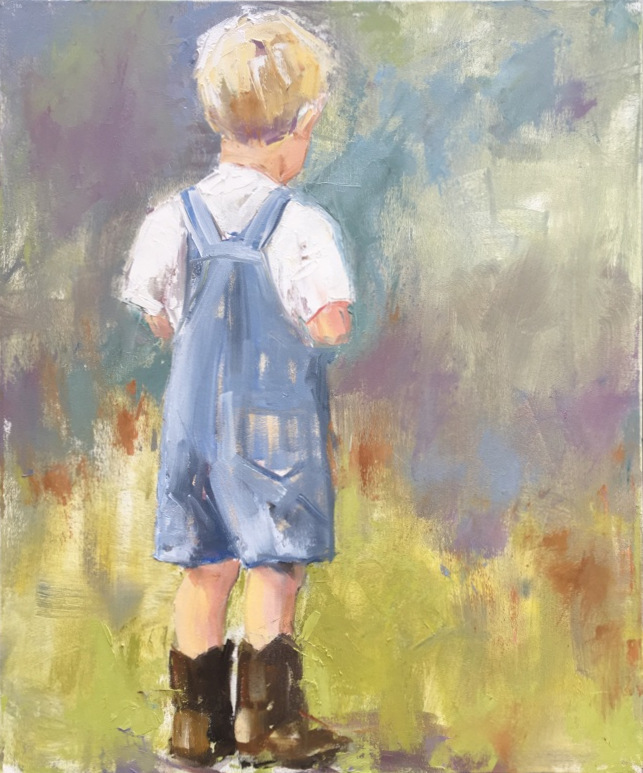 This one is painted on an 8 x 16 x 2" canvas. I am thinking and working through some things I learned last week at Anne Blair Brown's workshop in Nashville. I needed to get out of my studio and be reminded of the basics of a good painting. Anne is a master painter and teacher. I was reminded of many things I need to keep in mind while painting. She has a super video on her website if you can not make it to her workshop. " A painter's journey "
This is painted with oil on an 8 x 10 canvas. I have painted this hen before but it always turns out differently. This was done with mostly palette knife. 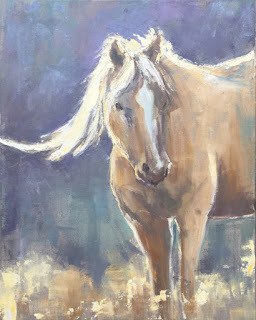 It is painted on an 8 x 10" linen panel. I am excited to be attending Anne Blair Brown's workshop for the next three days. The concentration is painting interiors and still life with expressive brushwork. She is a master of color, light and brushwork. Yay! I am planning on painting some smaller paintings in the next few week. I am very over due. This is painted on a 6 x 8 x 2" canvas. Happy Valentines Day. Radishes look a little heart shaped. I am preparing to do my first art show for the season. I will be at the Fine Art Event at Lipscomb Academy in Nashville, TN this Friday through Sunday. Come see me if you are in the area. 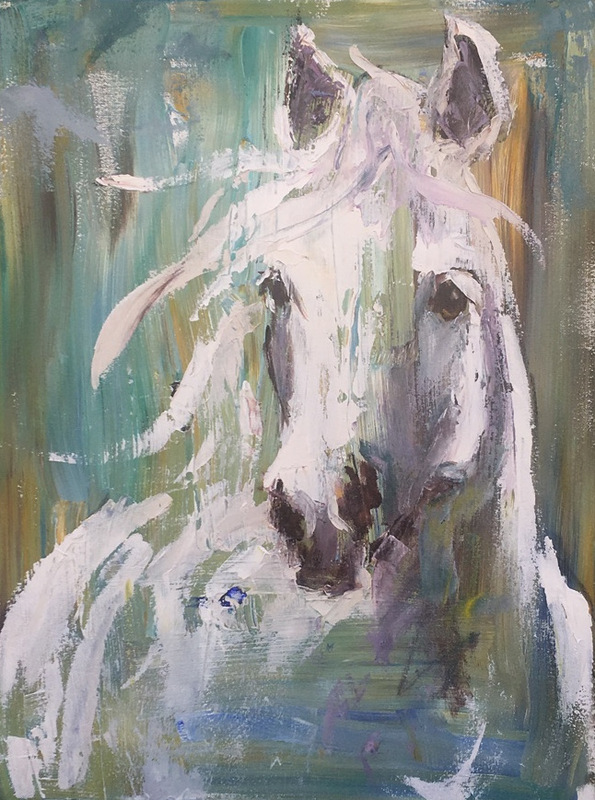 This piece is painted on an 8 x 16 x 2". I was hoping to be playing in the snow today but the snow never happened. This was a fun alternative. This is painted on a 36 x 36 x 2" canvas. There are still spaces available in my March 8 and 9 workshop here in Birmingham, AL. Email me at carolcarmike@att.net for more information. This painting will be with me at my next show Feb 8-10 in Nashville. I am participating in the Art Event at Lipscomb Academy. Always love visiting Nashville. This painting is an 18 x 24 x 2". My next art show is the Art Event at Lipscomb Academy in Nashville,TN February 8 - 10. I am still searching on the canvas. This is a large 36 x 48 x 2" canvas. I am on a little horse jag right now. I used to be a bit intimidated about capturing their beauty. Guess I am facing that fear. I would like to announce that I am planning a two day workshop here in Birmingham March 8 and 9. I typically have them at my home studio but friends have offered their new gallery/studio space that is much bigger. It is a wonderful space with lots of room to be creative. 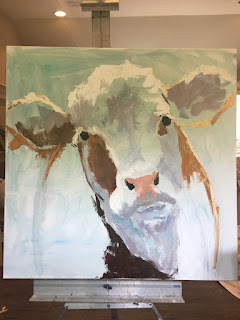 We will be working on painting animals and still life with expressive brushwork, color and light. Email me at carolcarmike@att.net for more information. Enough of the sheep already. No, but this and next month are a great time of exploration for me. I used acrylic to do a textured undercoating on this 18 x 24" canvas a couple of months ago. I rarely use acrylic and knew I was going to use oil on the top layer. I liked the vibrancy and texture and color in the underpainting and felt like it needed something powerful to go along with that. My work may seem a little disjointed now but I am determined to keep experimenting. I was listening to Lauren Daigel's song "inevitable" when this title reached out to me. She is the best! This 12 x 24 x 2" lamb did not want to be photographed. I use my i phone to photograph my work and it usually does a fair job. Elongated canvases are the hardest. I do not understand why and I don't really care to take the time to figure it out. There is also a terrible glare in the picture. Some days! I probably took 25 or so pictures of this painting and never got it right. Feels strange painting a snowy scene the last couple of days when we actually have beautiful weather outside. It is not so hard when we have our typical gloomy, cold winter days. I am working on a body of work with this theme and color palette. Very different from my colorful work. Not abandoning anything just changing it up for a bit. This is painted on a 20 x 24" canvas. I have been anxious about getting back to painting the last few days. My last month of painting was occupied by commissions. A different kind of painting for me because it has to resemble something. 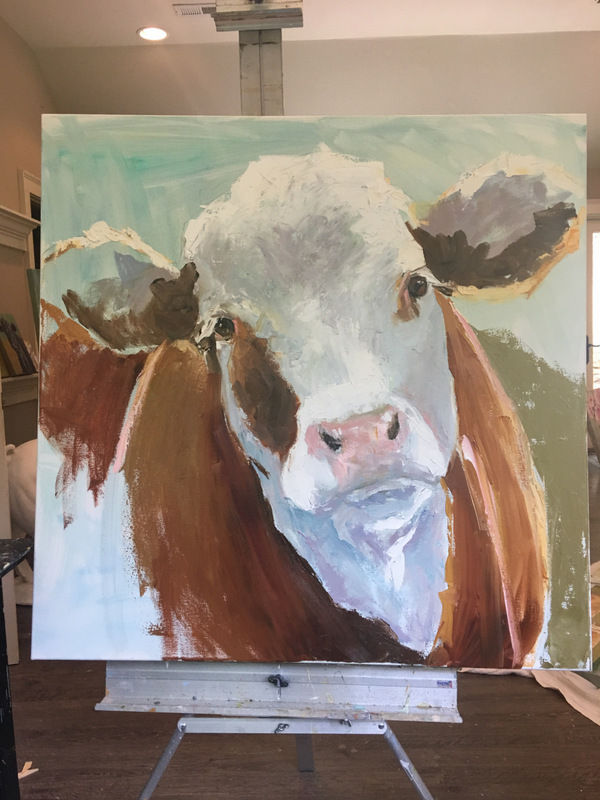 I am so happy that folks want me to paint their "loved things" but I sure do miss the freedom to mess up while I am doing them. I am pleased with the way this painting turned out. I could keep it as loose as I liked. It is painted on a 30 x 40 x 2" linen canvas. My next show is The Art Event at Lispcomb Academy February 8-10 in Nashville. I have not been to Nashville in a while and am really looking forward to it. Charlie belongs to an Atlanta friend. I met his Mom at an Atlanta art workshop with Tim Horn several years ago. We became fast friends because we were both so out of our element. It was a plein air workshop so I mostly walked around with no clue what to do. (Not because of the lack of direction by Tim. )I finally chose to paint an old shed close to where Beth was painting. I set up my cheap French easel that Jerry's Art sent me by mistake. They told me just to keep it because it was so worthless. Anyway, as I prepared to draw and paint the shed I promptly tipped the easel and palette on to my jeans. (It was the best work I did all weekend.) Even though I was so bad I still learned a lot that weekend from Tim. And...I met Beth and another friend, Jenny. Beth invited me to visit her in Colorado this past August. Charlie went on all the hikes with us and to visit the cow pasture each morning. He is the perfect little dog. I wanted to thank Beth for inviting me on such a fun trip. This is painted on a 12 x 12 x 2" canvas. I love a fluffy dog. Knox belongs to my friends daughter. This was an early Christmas present. It is painted on an 11 x 14" linen canvas. Goose belongs to one of my son's friends. His parents surprised him with a painting for an early Christmas present. The photo was taken at his first hunt. This is painted on an 11 x 14"linen canvas. This is a commissioned piece of my Mississippi friend's shih tzu, Willie. Sophie, the cavalier from my last post is her sister, sibling, friend, house mate.....Not sure what you would call that. This is painted on an 11 x 14 x 2" canvas. I am excited to say that I am about finished with my Christmas commissions. Yay! I have been busy painting Christmas commissions. Most of them are surprises so I can not post until after Christmas. Sophie belongs to a friend of mine that decided to treat herself with a portrait of her two dogs. I will post number two tomorrow. These are for her AND a surprise for her husband Christmas morning. 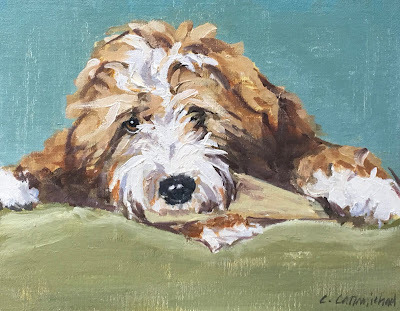 It is such a honor when people ask me to paint their dogs. I get stressed out this time of year but am always happy when others are brought joy from one of my paintings. Cavalier King Charles Spaniels are one of my favorite breeds of children. :) This is painted on an 11 x 14 x 2" canvas. I am preparing for my last show for the Fall and for my Open studio next Thursday. I will be in Covington, LA this Saturday and Sunday for the Three Rivers Art Festival. It will be my first time to do a show in this area so come see me if you are close. My Open Studio is next Thursday evening from 5-8. More about that early next week. Email me at carolcarmike@att.net for more info. This painting is a 24 x 36 x 2" and will be available at my Open studio next Thursday for 25% off it's original price. This is a large 36 x 48" piece. I am preparing for my final shows of the season. I will be in Covington, LA for the Three Rivers Art Festival Nov 10 and 11. First time for me in this area. Always fun to explore a new place. I am having an open studio sale Thursday, Nov 15. I open up my studio and the garage below filled with work for sale . Last year was the first time I did it and it was lots of fun. A great time to get gifts for yourself or others. The hours are 5-8. Email me at carolcarmike@att.net for more information. One thing I love about painting and being an artist is that you are always learning. There is no ceiling or cap. I always knew that I wanted to paint loosely from the time I began painting. I like this painting but I wish the bowls were looser. I love it when I can lose some edges and it still reads the shape of the bowl. That did not happen this time but it might next time. This is painted on a 30 x 30 x 2" canvas. My next show is in Bluffton, SC and is the Historic Bluffton Arts and Seafood Festival. I did this show for the first time last year and loved the area. If you are not familiar with Bluffton, it is close to Hilton Head and not too far from Savannah. the dates of the show are Oct 20 and 21. I had a bit of a staycation this week. I have a hard time staying out of my studio when I am home but this week I enjoyed getting some much needed rest, sleep and I binge watched "hell on wheels". Having art shows back to back weekends takes a lot out of you so a break felt good. This piece is painted on a 40 x 40 x 2" canvas. It will be with me at my next show in Bluffton, SC Oct 20 and 21. 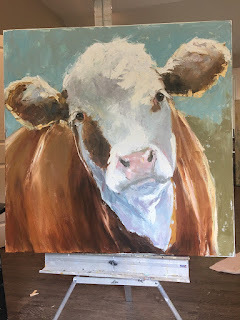 This morning I had a little free time so I had to make a choice between exercising and painting. Painting won out. I am one of those weird people who likes to exercise so it was not an easy decision. I leave in a few minutes to set up for a show in Huntsville, AL. The Monte Sano Art Festival is tomorrow and Sunday from 9-5. Come see me if you are in the area. This piece is painted on a 12 x 24 x 2" canvas. Hope your weekend is great. Praying for those on the east coast. I had to pull a line from a song I was listening to at the time of posting for this title. Elton John's "yellow brick road" was playing. When you have painted as many roosters as I have it is hard to come up with new names. This is painted on a 24 x 24 x 2" canvas. Come see me in Huntsville, AL this weekend at the Monte Sano Art Festival if you are in the area. Prayers and thoughts going out for those in the path of the hurricane. I am headed up to art shows in north Alabama for the next two weekends. This Saturday and Sunday, Sept 15 and 16 is the Monte Sano Art Festival in Huntsville, AL. The following Saturday and Sunday, Sept. 22 and 23 is the River Clay Art Festival in Decatur, AL. One of the reasons I enjoy these shows is that my sister and brother and law live close. I have gotten some of my best rooster and chick photos from their flock. It would make me so happy to drive up and see these colorful chickens greeting me. I say all this in the past tense because they are in the process of building a new chicken coop so no chickens right now. I would love for you to come see me and the other artists if you are in the area. Click on the links to learn more about these shows. This is painted on a 12 x 12 x 2" canvas. It felt good to find some time to paint today. I rested yesterday after a three day show in Marietta, GA. It was very hot but several of my pieces found some new homes. My next show is the Monte Sano Art Festival in Huntsville, AL. It is Saturday, September 15, 9 -5 and Sunday, September 16, 9-4. The next weekend I will be in Decatur, AL for the River Clay Art Festival. Sept 21-23. This little guy is painted on a 20 x 24 x 2" canvas. In case you were tired of me painting cows. This is painted on a 24 x 30 x 2" canvas. I am participating in Art in the Park in Marietta this Saturday, Sunday, and Monday. Sept 1-3, 10-5 each day. Looking forward to seeing some of my Atlanta area family and friends. My booth # is 228. I just returned from a lovely and inspiring trip to Crested Butte, CO. This cow lived a couple of blocks from where I was staying with my friend. It was fun to take walks at different times of the day and see the beautiful mountains that surrounded a huge field of cows. I would get so excited that I had a hard time keeping my hands still enough to take pictures. I am in awe of the beauty of our country. Thank you to my friend Beth for allowing me this experience. We met at a Tim Horn workshop several years ago and were instant friends. This cow is titled Tom because Tom Petty was one of the artists we listened to a lot while in CO. It is painted on a 36 x 36 x 2" canvas. I thought I would share some extra photos of my process. I will be in Marietta, GA Sept 1-3 for Art in the Park. I would love for you to come see me if you are in the Atlanta area. Click on the link for more information.